Greetings from International Congress on Food Processing, Safety & Packaging!!! On the behalf of the organizing committee of Food Congress 2018, it gives me immense pleasure to invite you to be an upcoming event – Food Congress 2018. Working under the theme: “A Step towards Food Quality Leads Healthy Living”. 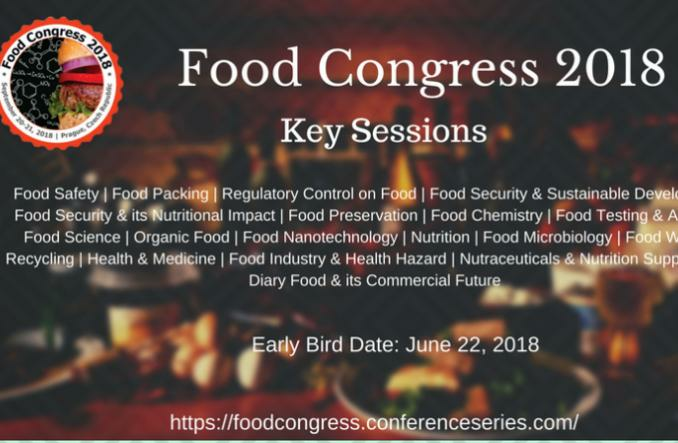 After a successful conference in 2017, once again we are hosting the “International Congress on Food Processing, Safety & Packaging” Conference along with Editorial Board Members, Pharma Companies, Researchers, Academicians, Young Researchers, food educators, food inspectors, & fiery inspectors under the sessions: Food Safety | Food Packing | Regulatory Control on Food | Food Security & Sustainable Development | Food Security & its Nutritional Impact | Food Preservation | Food Chemistry | Food Testing & Analysis | Food Science| Organic Food | Food Nanotechnology | Nutrition | Food Microbiology | Food Waste & Recycling | Health & Medicine | Food Industry and Health Hazard | Nutraceuticals & Nutrition Supplements | Diary Food & its Commercial Future. Food Congress | Conferences | World Meetings | Europe | 2018-2019 added 2 new photos. Nancy Willy created a Event listing.